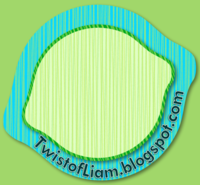 Teaching with a Twist of Liam: Blog stalking? Who? ME?? Over at Clutter-Free Classrooms, I was again reminded that North America is wrapping up for their summer holiday as New Zealand is nearly halfway done the year. Oh, Canadian Summers, how I miss thee. The question was raised, asking what blogs we stalk. 'Stalk?' I wondered. Hmm...not sure if I like that word. Well here they are. Check them out and enjoy. Yep. That's about all I follow so far. Maybe in a few weeks that list will be ten times longer! Hey, thanks for the mention! I just posted, so I thought of you and thought I'd better head on over to your blog to see what's up! P.S. Loving all your posts!